October marks one year since Hurricane Sandy devastated regions of New Jersey and New York. While the catchy media jingle “Stronger Than the Storm” became an earworm, social work students in these affected areas were busily demonstrating their strength in helping survivors heal throughout this challenging year. When disaster strikes, social workers always are part of a response team to help the injured, displaced, and beleaguered. In the wake of Sandy, however, some social workers and their academic communities found themselves among those needing help. Still, they mustered their spirits and marshaled their skills to help each other, their university associates, and their community partners and clients. While often reeling themselves, they tended to people’s needs in the areas hardest hit after the hurricane cut a path up the eastern seaboard, decimated the New Jersey shoreline, battered the coast of New York, and flooded much of Lower Manhattan on October 29, 2012. Social workers throughout the affected regions waded in to help, especially in the parts of New York and New Jersey most affected by the storm. Among them were the students, faculty, and administrators at Rutgers University School of Social Work, with campuses in New Brunswick, Newark, and Camden, NJ, and those of Adelphi University School of Social Work, in four New York locations—at two campuses on ravaged Long Island, one in sodden Manhattan, and another in the nearby Hudson Valley. A grant from the Robin Hood Foundation and a partnership with the New Jersey Association of Mental Health allowed direct outreach to community members in counties most damaged by the storm—Monmouth, Ocean, Atlantic, and Cape May, NJ—through a project called the Sandy Disaster Relief Initiative (SDRI). Disaster relief fellow Rachel Alvarez is particularly proud of one of the many SDRI projects: a community-building event held this spring in Sea Bright, NJ. “We had dessert and coffee, and a local high school band provided music, but the main purpose was to create a venue where neighbors could reconnect and spend time with each other.” Alvarez brainstormed with Frank Lawrence, a volunteer coordinator, to decide what mental health needs were most urgent. Together, they created a process by which they could mold services to individuals’ specific needs. The event, she says, led to the creation of focus groups to determine the specific nature of the services that would help the Sea Bright residents move forward both socially and emotionally. The disaster relief fellows and community outreach workers continue to provide outreach and case management to the four devastated counties, Moroso says, and are helping community members with a long-term recovery plan. The grant project ends in September; however, “Rutgers University School of Social Work plans to continue to train students in disaster and trauma relief through additional private funding,” she says. Adelphi University itself was affected and, in part, temporarily shut down by the superstorm, suddenly making its students, faculty, and administrators clients as well as service providers, explains Carol S. Cohen, DSW, an associate professor at the School of Social Work. In the early days, they galvanized attention and took action to help provide immediate relief and moral support and to get students and the school up and running again. For example, the school immediately started a Facebook page to help people stay in touch; the university lent laptops to people who’d lost their computers; and a relief drive, including direct aid and support, was spearheaded for survivors, which included the members of the School of Social Work community themselves as well as clients in the wider community. A team worked to transform a student lounge into a respite area where students and faculty could process how they viewed the posthurricane experience “through their social work eyes,” as Cohen describes it. Workshops on disaster relief were held, and students and faculty also gathered forces and rolled up their sleeves to help with demolition and rebuilding. Two students in Adelphi’s School of Social Work who participated in these community-building activities observed how the storm brought out both the best and the worst in service providers and, for them, the opportunity to bring a social work sensibility to these activities not only helped other storm survivors in the community but also contributed to their own healing. Out of the discussions, the Oral History Project was created. One of the more unique responses from social work communities, this ongoing project allows everyone involved to share their impressions of the ways in which the professional and the personal have collided. Cohen, along with other volunteers, began to collect oral histories of any students, faculty members, or administrators who were directly affected by the hurricane and who could “use their social work lens and their personal lens” to create a record of the storm’s impact. “We hope the project will tell us a lot about service delivery, help influence policy, and make a difference in future disasters,” Cohen notes. She says every time disasters strike, it’s a learning experience. 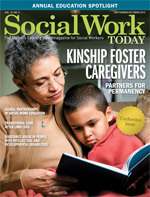 Because social workers and social work students in this tragedy were both survivors and service providers, Cohen suggests they have a unique point of view that will help inform future disaster relief efforts.